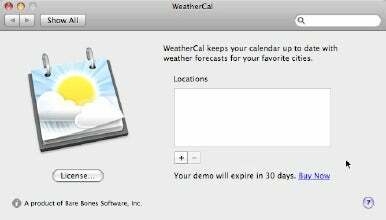 Bare Bones Software — maker of the popular BBEdit text editing software app — on Wednesday announced WeatherCal, a new utility that embeds weather forecasts in your iCal calendar. It costs $10. A demo version is available. WeatherCal lets you input multiple locations, forecasts are plugged into your iCal calendar as all-day events. WeatherCal creates calendar objects which contain that day’s weather along with four days of forecasts. The information is presented in iCal as an all-day event which you can read at a glance. Calendars and events synch to other computers or the iPhone or iPod touch along with other iCal sync data, using MobileMe or local iTunes syncing. You can input city or location by typing in the name of the location or its zip code; it works with weather locations all over the world, which means that WeatherCal can be used to predict weather when you’re traveling. If you’re going to be in Salt Lake City on Tuesday and Seattle on Thursday, for example, WeatherCal can help you plan what to bring. The software creates links to the Weather Underground forecast Web page for that day, so if you double-click on the event, you’ll find a URL you can use to get more detailed information. System requirements call for Mac OS X 10.5 or later. It’s a Universal binary.